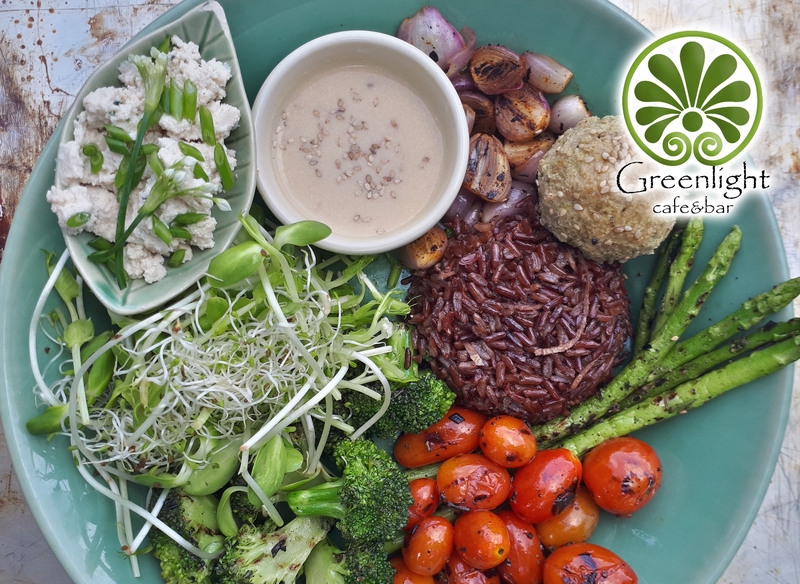 Have	Greenlight Cafe	delivered to you, anywhere on Koh Samui! For only 100 baht! Join us at Greenlight Cafe & Bar for a unique, interactive and chilled cafe experience. Our menu features a variety of hearty choices for health-conscious eaters. We offer vegetarian, vegan, and gluten-free meals along fish and chicken options. Nearly all of our ingredients are locally sourced and organic. Many of them come straight from our very own garden! Ask one of our staff members for a garden tour when you stop by. At Greenlight we strive to provide a cozy and forward-thinking space where locals and tourists alike can gather, relax, and share ideas. Building community is our passion and we look forward to welcoming you. Delicious and healthy gluten - free banana pan cakes with seasonal fruits and coconut caramel. Organic white quinoa porridge cooked with coconut milk, cinnamon and nutmeg, topped with caramelized banana. Our house - made baked coconut granola with seeds, raisins, goji berries & coconut syrup. Served with seasonal fruits and homemade coconut yogurt or coconut milk to your choice. Two free-range eggs cooked to your liking ( omelette, scrambled, poached, sunny side up), served on sour dough bread toast with grilled tomatoes with thyme & garlic, fresh herbs chutney, salad, sprouts and sesame sauce. Fresh tropical fruits with super food chia seeds pudding with coconut milk, vanilla and goji berries – great source of healthy omegas , protein & minerals. Rolled oats in spiced stew with zucchini, leek, ginger, basil and grilled mushrooms, spinach, sweet chilli, shallots, mix seeds and fried egg. Delicious and healthy way to start your day! Grilled sour dough toast with organic peanut butter, home made sugar-free mango-passion fruit jam, caramelized banana with cinnamon, nutmeg & coconut caramel, topped with chopped nuts & mint. Creamy tofu scramble with sautéed spinach, mushrooms, sweet chili, leek, served with fresh herbs chutney on sourdough bread toast with sesame sauce and sprouts. House-made wrap with grilled chicken, mango and herbs salsa, grilled vegetables, onions, fresh salad, sprouts, chives, sesame and tomato sauce. House-made wrap with our baked falafel, grilled vegetables & onions, spicy chick peas, marinated cabbage, fresh salad, sprouts, herbs, hummus and sesame sauce. White quinoa with avocado, grilled sweet chili, fresh salad, cucumber, celery, sprouts & creamy ginger - mustard sauce wrap in nori seaweed paper. Fresh brown rice rolls with seasonal vegetables, marinated cabbage, fresh salad, sprouts, local herbs & tamarind-peanut sauce. Grilled mushrooms in creamy coconut sauce with sweet chilli, hummus spread, served on grilled rye sour dough with fresh salad, herbs & miso-tahini sauce. Wild salmon fillet grilled with mustard oil and shallots on dark sour dough with house-made mayo sauce, grilled tomatoes, fresh salad, fried egg, feta, sprouts, chives and miso-tahini sauce. Our signature delicious rolls with probiotic marinated daikon, house-made vegan pesto, cucumber, sprouts, rocket, vegan parmesan and sesame sauce. Platter with two baked falafels, house-made hummus, grilled beetroot & fennel spread, green kalamata olives, fresh greens, veggies, sesame sauce and your choice of slice grilled rye sourdough bread. House made hummus, topped with sticky chickpeas and extra virgin olive oil. Served with assorted fresh vegetables and grilled rye sourdough bread. Roasted pumpkin & chickpeas dip with cumin, smoked paprika and grilled sweet chili, topped with spicy chickpeas and extra virgin olive oil. Served with assorted fresh vegetables and sourdough bread. Hand-cut baked sweet potato, tossed with smoked paprika, spices & Himalayan salt, served with house-made tomato sauce. Platter of homemade vegan cheese (feta, cream-chives, parmesan) with toasted nuts, green kalamata olives, rocket, hummus and grilled beetroot & fennel spread. Served with gilled rye sourdough bread. Warm salad with grilled curried chicken, roasted sweet chili and bean sprouts, fresh lettuce ,local herbs: basil, celery, betel leaf, green mango, shallots with garlic & lemon grass coconut dressing. Delightful salad with grilled french beans, leek & roasted sweet chilli, fresh lettuce, spinach, basil, rocket, toasted pumpkin seeds and sesame-citrus dressing. With homemade vegan cream-cheese & shaved parmesan. Wild salmon fillet grilled in ginger and sweet chilli vinaigrette, grilled cherry tomatoes, bokchoi, fresh lettuce, sprouts, coriander and sesame - soy dressing. Grilled vegetable mix of bell peppers, zucchini, tomatoes, white onion, broccoli, cauliflower, baby corn in rosemary, ginger & olive oil marinade. Warm nourishing red quinoa salad with roasted beetroot, grilled shiitake and portobello mushrooms, green peas, shallots, citrus slices, fresh lettuce, basil, sprouts & sesame sauce. Crunchy lettuce, local celery, herbs, cucumber, red spinach, daikon, fennel, green mango, sprouts with olive oil & mustard dressing. Flavorful salad with young green papaya, green mango, sprouts, local herbs, pomelo, celery, cherry tomatoes, chili, garlic, shallots, lotus chips, toasted curried cashews & sesame oil. Pan-grilled wild salmon fillet in sesame & ginger glaze with stir-fry soba noodles, roasted green beans, spinach, celery, bokchoi, sweet chili, chives, local herbs and sesame - soy sauce. Fragrant, sweet & gently spiced grilled chicken with roasted pineapple, cucumber, carrots, thai basil, coriander and probiotic cabbages law, fresh greens, sprouts and tamarind - chilli sauce. With side of organic brown/ wild rice. Deliciously poached wild salmon fillet in miso lemon grass broth, with asparagus, enoki & shimeji mushrooms, bokchoi, ginger, sweet chili and herbs. Creamy tempting soup with roasted mushrooms, caramelized fennel and garlic, ginger, leek with wild rice, fresh thyme and delicious vegan parmesan, creamed with coconut milk. Flavourful baked pumpkin soup with thyme, rosemary & spices, roasted vegetables, onions, coconut milk, topped with sprouts, toasted seeds and smoked paprika. Served with slice of grilled rye sour dough bread. Bright & refreshing tomato soup with bell pepper, celery, cucumber, zucchini, shallots, topped with fresh herbs chutney paprika and seeds. Gently spiced roasted tomatoes soup with sweet chilli, paprika, onion, leek, fresh herbs, garnished with sprouts, chives & seeds. Served with slice of grilled rye sour dough. Marinated grilled free - range chicken breast in creamy mustard & thyme sauce with roasted vegetables: green beans zucchini, carrots, bell pepper, shallots, fresh greens sprouts and herbs served with brown rice. Grilled banana leaf sea bass in house-made yellow curry sauce with miang kham salad: bettel leaf, thai basil, shallots, lime, cucumber, coriander, green mango, sprouts and toasted cashews served with brown rice. Ultimate grilled portobello mushrooms burger with house-made pesto sauce, fresh salad, roasted fennel, asparagus, bell peppers, onions, sprouts, fresh herbs chutney and miso-sesame sauce served with brown rice. Grilled wild salmon in house-made teriyaki sauce with asian twist stir fry glass sweet potato noodles and vegetables shiitake mushrooms, local herbs, lemongrass garlic and sesame. Chocolate bliss raw cashew cream with natural vanilla & maple extract, nut free crunchy crust with organic raw cacao nibs. Velvety smooth probiotic raw coconut cashew cream with dates, natural vanilla and light coconut crust.